Firstly, before I start my rambling, here is the link to my last long, slow run before the Zurich marathon http://connect.garmin.com/activity/78131770. I followed all the advice on the running sites to the letter and didn't try and slip in some extra kilometres. I covered just over 15km and the kept the pace to around 10km/h, which is really comfortable for me. Now, as the MDS is really a completely unknown and unchartered territory for me, I decided to look for a book on the subject. There are quite a few books on the subject of endurance running, but in fact very few on the specific topic of the MDS. The one I bought in the end was "Marathon des Sables - ultra endurance running in the heat of the Sahara". I have only got 50 pages into the book so far, but it seems a really interesting read. The best part of all is that I can relate to the author, because this was also his first initiation to the world of endurance running. I was rather surprised in fact that he had only run his second half marathon of his life with almost one year to go, and didn't really increase his normal training runs above half marathon distance until the event itself. He did however do a lot of extremely long hikes, a couple of desert excursions from Cairo and so on. Somehow I can't help to feel that my training will be more advanced than this provided I don't suffer any serious setbacks. After the Zurich marathon I will be taking a week of recovery and then I will be hopping on my bike to start training for the Marmotte cyclosportive (climbing 5,000 vertical metres in one day) which starts in early July. I will also try and keep up a certain amount of running, albeit less than now since it will have to be balanced with the cycling. After the Marmotte and a week or two of recovery I will have to hop on my bike again to make sure I am prepared for the Vuelta Sudamerica 2011, taking place at the end of September. Although I have decided to cut the tour short to allow me to explore Peru with Anny, I will still be cycling over 5,000km in the course of 2 months, reaching altitudes of up to 4,000m. I am not sure if it will be possible or not, but the aim would be to fit in some running during the tour. When the tour finishes I will have one month to explore Peru with Anny, and during this time running will be possible for sure. 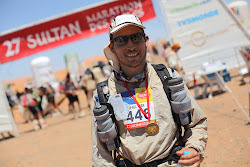 When I get back from Peru, it will at the beginning of 2012 and then there will be 3 solid months of training before the MDS. Jobwise I have already informed my boss I will be away for 4 months at the end of 2011, and I have been given no absolute guarantee of a job upon my return, so it may be that I am a full time athlete depending on if I find a new job or not before the MDS. Unless I have found a job and they want me to start before mid February, I may well postpone the start date till mid April by which time I will have finished the race. Apparently a lot of people who finish the MDS become slightly depressed for a few months afterwards, as everyday life seems too easy and no longer challenging. For this reason maybe I can immerse myself into a new job and start planning for other things such as marriage. First though I have to get through the MDS.